On 13th Feb, the Guardian had a front page ‘special report’ on how Tesco and Asda had undertaken "...cynical and aggressive" price rises in the week before Christmas. The figures provided showed that for Tesco over 1,500 items had price increases between 9th and 22nd December with an average increase of 32p. Tesco countered this by saying that they dropped the prices of 2,638 products with an average decrease of 54p over the same period (i.e., more products with prices dropped and a higher average price reduction). 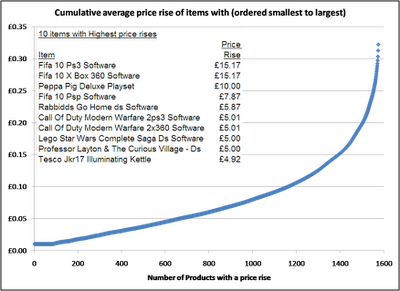 Also, looking at the top 10 price rises it can be seen that 3 of them are for the same product (FIFA 10) on 3 different formats which, it could be argued, gives an unfair distortion of the figures. If you were looking to show a lower level of average price rise you could just focus on Groceries rather than including non-foods where the absolute rise will be higher due to the generally higher item price. It’s also likely, however, that Tesco’s price cut figures have a similar level of skew. The other point to make is that the average in this case would only be valid in terms of the impact to the customer if all the items were sold in the same quantities. A penny on a pint of milk is likely to yield more profit that would be lost by knocking a pound off an obscure item. The Guardian yesterday (22nd Feb) issued some new data around the supermarkets’ use of 1p discounts to promote a feeling of a ‘price war’ between supermarkets. The tone is that supermarkets are being ‘sneaky’ as the majority of price cuts (70% for Tesco) in the period 16-23 Dec 2009 were for just 1p when the typical price rise is higher. The Guardian implies that when Tesco (and Asda) cut prices they cut them by a little amount and when they put them up they put them up by a greater amount so the consumer pays more overall. This implication is only valid if the overall comparative volume of sales from discounted and increased items results in a higher overall basket. If customers buy 10 times the volume of an item discounted by 1p as an item increased by 5p then overall customers are better off than they were before the price changes. With the huge range of products available it is easy for any supermarket to cherry-pick which prices it manipulates to look good in comparison to the competition. This should be taken for what it is, headline grabbing marketing, rather than each retailer cutting prices to the bone to give you, as the customer, the best deal possible. All the noise in adverts about which retailer is the best probably cancels itself out so you are left with the same impression that you had as before of the main supermarkets. But none of the major supermarkets can risk not running similar campaigns for fear of customers believing the version of events its competitors run. It would be interesting to see what this flurry of price cutting adverts has done to the extremes of the market – for example Aldi or Lidl at the lower end, Waitrose or M&S at the higher end. Has the advertising of the big players made the low end seem irrelevant and the high end seem even more expensive by comparison? Or has the ‘price war’ lumped the main supermarkets in with the low cost brands and therefore created a distinction in quality for Waitrose and M&S? The moral of the story is to make sure that you have access to the raw data behind any figures as, depending on which side of the fence you sit, you can ‘prove’ pretty much anything you want by defining the terms of the analysis and the metrics used.